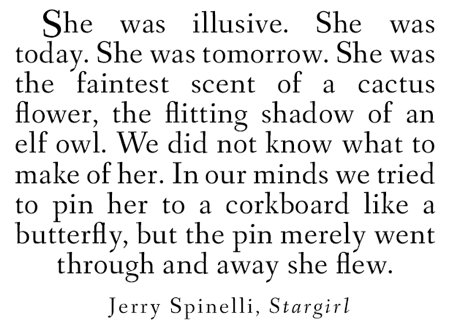 From the day she arrives at quiet Mica High in a burst of colour and sound, the hallways hum with the murmur of “Stargirl, Stargirl.” She captures Leo Borlock’ s heart with just one smile. She sparks a school-spirit revolution with just one cheer. The students of Mica High are enchanted. At first. I think that’s a fair title for this review – since readers have made trailers for this book and teachers have made notes. It’s been round long enough to count – yet it still has something to say to contemporary adolescents. 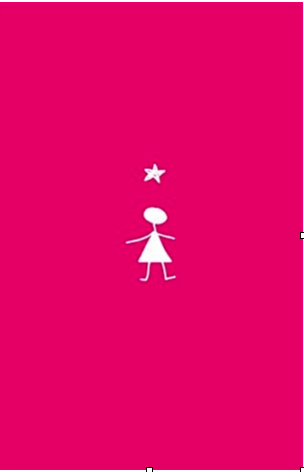 I actually have the bright pink copy with the silver Stargirl stick figure on it seen above. (There are other colourways). It’s not perhaps what you might expect from me – but it’s good to read different kinds of book. It shakes you up, makes you think again. This one snuck right past my analytical and sceptical scanners. I’ve rarely been keen on High School set novels, finding them full of cliché and stereotypes, but this didn’t annoy in that way. It could be how convincing the Arizona setting is, or how the recognisable characters and dynamics are shown with a dash of poetry, or both. It is very American - some aspects of the sports played mildly puzzled me but it doesn’t matter to the story – it all adds flavour. There’s something fable-like about it. It’s modern in that slightly out-of-ordinary-time way – not much in the way of contemporary references to date it too much. It’s funny and thoughtful and sentimental. There will be those of a more cynical cast who loathe it – but for those who enjoy needing a tissue-box beside them when they read, it’ll be a bitter-sweet treat.